Are you pregnant and suffering from morning sickness? Are you super sensitive to smells? Now there is a simple and effective solution! 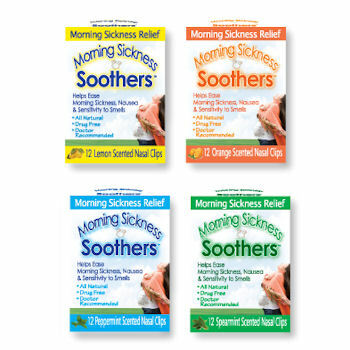 Morning Sickness Soothers is a revolutionary product specifically formulated to provide a drug-free, natural way of easing morning sickness, nausea and sensitivity to smells. 12 Single use scented nasal clips. Simply insert clip into your nose, onto nasal septum. How do I apply Morning Sickness Soothers? It’s easy! Simply slip the Morning Sickness Soother into your nose onto your nasal septum (the cartilage separating your nostrils). That’s it! Simple, fast and effective. It’s easy to apply and can be used anytime, anywhere. Purchase Morning Sickness Soothers from our retail website, BabyHopes.com. What are Morning Sickness Soothers and how do they work? Using patented technology, Morning Sickness Soothers are specifically formulated to provide an all natural, drug-free way of easing morning sickness, nausea and sensitivity to smells. A soft flexible piece containing natural essential oil slips discreetly and comfortably into the nose to help interrupt the nausea cycle and help counteract and neutralize undesirable odors. Virtually undetectable, Morning Sickness Soothers deliver a constant, gentle infusion of natural mint or citrus aromas that serve to refresh and rejuvenate and help side-step the onset of morning sickness and nausea. Are Morning Sickness Soothers safe for pregnancy? Morning Sickness Soothers are safe and immediately effective since the natural essential oil aroma is inhaled rather than applied to the skin or ingested. There is neither any medication, nor any newly created substance in them. All of the essential oils used in Morning Sickness Soothers have been “Generally Recognized As Safe” (GRAS) for use in the U.S. and Europe. Morning Sickness Soothers do not cause drowsiness, pose any risk of operating machinery, and do not react with other medications. Please discuss any questions you may have with your health care provider before considering any product safe for pregnancy.